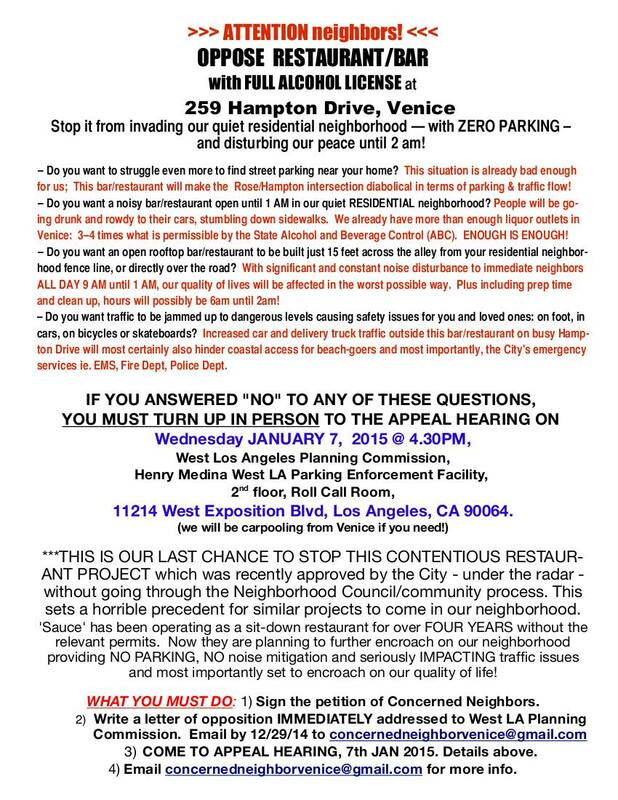 LAST CHANCE TO STOP THE CONTENTIOUS RESTAURANT PROJECT @ 259 HAMPTON DRV. Pasadena CA, December 5, 2013— The Ninth Circuit Court of Appeals heard oral arguments today regarding Desertrain vs. the City of Los Angeles, a Venice Beach lawsuit. 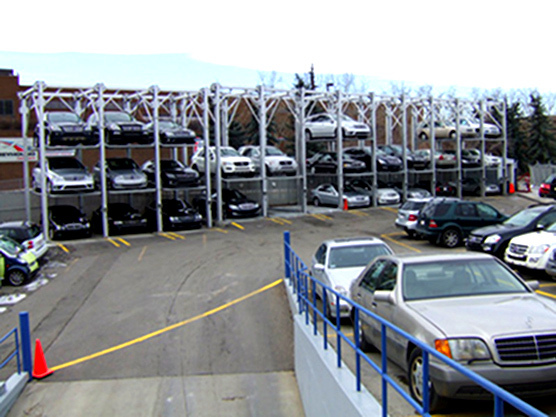 The vagueness of Los Angeles Municipal Code (LAMC) 85.02, the city ordinance making it illegal to habitate in a vehicle, was the main topic for the oral arguments presented by Civil Rights Attorney Carol Sobel. LAMC 85.02 was used during a concerted Venice homeless eradication effort. This effort included a special Los Angeles Police Task Force that arrested, towed, ticketed, and threatened homeless people accused of living in a vehicle. The lawsuit was originally filed in 2010 alleging that the City of Los Angeles violated the Fourth, Fifth, and Fourteenth Amendments, and the Americans with Disabilities Act. 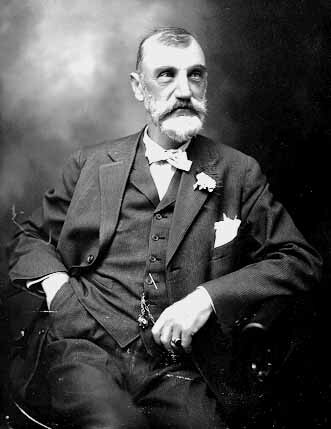 The case was not successful in the lower federal court, but was appealed to the 9th Circuit Court of Appeals by Sobel. The three judge panel especially questioned the enforcement criteria and lack of duration for LAMC 85.02. “The City Attorney had difficulty answering the questions posed by the judges” according to plaintiff, Steve Jacobs-Elstein. Venice is a special coastal community historically known for the diversity of its population; a community known for acceptance and tolerance. It is home to one of the largest free clinics in the country and provides homeless services second only to the skid row area in Los Angeles. As Venice property values continue to soar, comes an influx of newer residents who can afford million dollar buildings by the sea, and hardships increase for those who can no longer afford to be housed in the community. Surely, with all this new wealth, better solutions can be created. While LAPD officers hassle, harass and harangue the homeless on Venice beach, stealing their meager possessions and tossing them into sanitation trucks, as they did at 3:00 am on the morning of Friday, May 13, 2011 –LAPD Captain Peters appears to have a soft spot for Darlene Knoll, a long-time Venice resident RV dweller. A disabled paraplegic artist of color was ordered to get up and leave the area. As he struggled to climb into his wheelchair, his lifeless legs dragging on the ground, the LAPD officer told him that if he didn’t move faster he would confiscate all his possessions. The artist continued to struggle but was unable to comply with the officer’s demands quickly enough. He watched in despair as the officer STOLE his bag of painting materials (his very livelihood) and threw them into the waiting sanitation truck. 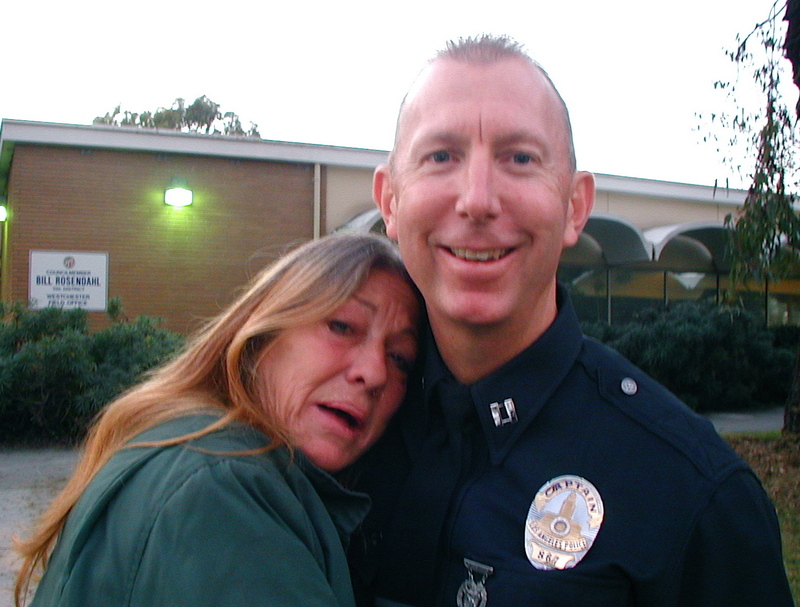 While Peters leads the charge against people living in their vehicles and sleeping on the beach, he shows what appears to be a rare moment of sympathy and comfort to Darlene –who was threatened repeatedly with arrest by LAPD officers –for documenting the arrests of poor people and the towing of their vehicles during the police sweep of RVs in Venice over the 2010 Thanksgiving/Christmas holiday season. More often than not, though, Capt. Peters dances to the tune of an elite group of Venice residents who call themselves “Venice Stakeholders Association (VSA)”; whose prime motive appears to be the gentrification of Venice and the destruction of the time-honored free “Spirit of Venice” that has drawn millions of visitors to Venice Beach, California, over the decades, since Abbott Kinney first created his visionary “Venice of America” city out of coastland marshes. Back in the day, Venice was a place where people came from all over America and the world –to have fun, let off steam and express themselves, as in the case of prominent civil rights leader, feminist Susan B. Anthony; who is reported to have expressed her political views from the west side of Venice beach boardwalk in the area now known as the “Free Speech Zone”. This tradition has continued to the present time, peaking in the 1990s when artists, entertainers, performers, religious, ideological and political “expressionists” proliferated in the Free Speech Zone. In recent years the City of Los Angeles has succeeded in turning this once expressive Free Speech Zone into more of a swap meet ambiance by condoning vending of mass-produced trinkets and bric-a-brac that carry little or no intrinsic “free speech” message. 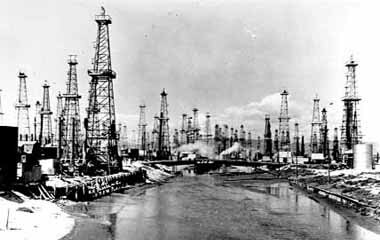 The community’s tie to the story of the free speech zone continued into the 1930s; Venice property values depreciated dramatically when the oil boom hit the coastal area, continuing into the 1940s, 50s and 60s. In the late 1950s and 1960s beats and hippies moved to Venice, congregating in coffee shops and low-cost housing. Another history was made, now firmly establishing a tradition of free expression that has carried over to present times. 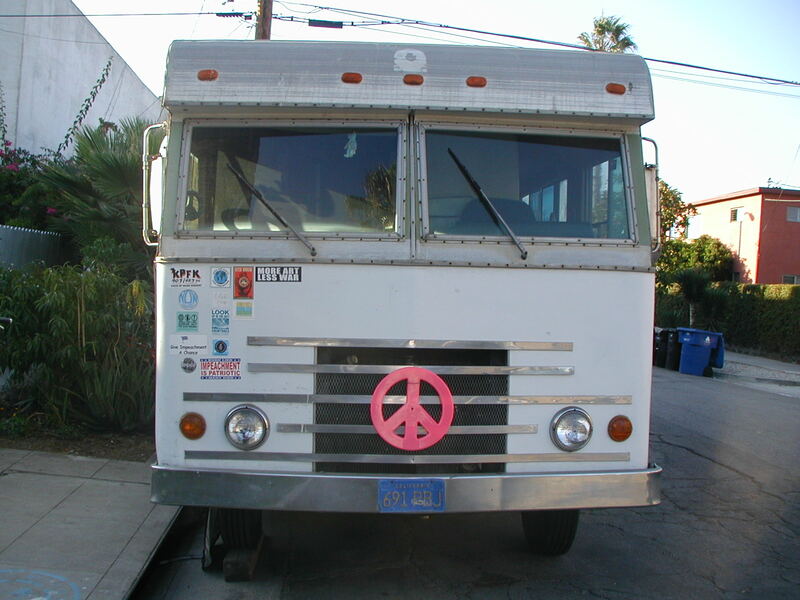 Young travelers hitch hiked from all over America drawn to the creative freedom of Venice beach; Houseless people found a home on the beach; alternative lifestyle denizens, dubbed “rubber tramps”, parked their RVs and vans on public streets; displaying their artistic creations in the Free Speech Zone. Long-time residents of Venice, originally drawn by the 1930’s oil boom and the subsequent low property values, learned to live side by side with their eclectic new mobile neighbors, establishing a relationship built upon tolerance and goodwill; further promoting the ambiance of expressive freedom that has historically made Venice what it is. Venice thereby accommodated low-income and poor people for decades, while neighboring cities like Santa Monica and Marina Del Rey pushed development. Then, in 1976 the California Coastal Act was created –to protect over-development of California coastal areas, subsequently restricting rapid development in Venice, which had lagged behind its more affluent neighbors. Consequently, Venice continued, through the 1970s and 1980s, to offer affordable accommodation to residents and travelers alike. Moving forward into the 1990s, Venice continued to attract low-income residents and travelers, thanks to the California Coastal Commission that had created the Coastal Act — and this, together with the Mello Act, a California State Law that requires all development within the coastal zone (1 mile from the coast) to include affordable housing. 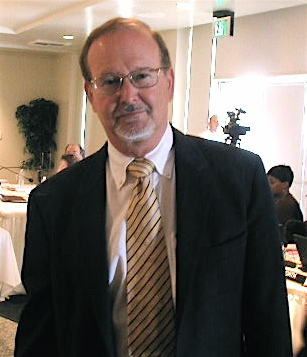 In 1998, POWER member group Venice Community Housing Corporation, along with other neighborhood associations, sued the City of Los Angeles for not enforcing the Mello Act. In 2001, this group won a settlement –forcing local developers to either set aside 20% of their units as low-income housing or 10% of their units as very low-income housing. Throuhout, the Venice tradition of serving low-income and poor people was sustained until approximately the year 2000; when the last oil well in Venice (1965-2000) was removed from the beach at Windward Avenue, and its monstrous decoy, the Venice pavilion, was demolished, opening the door to rapid development and gentrification of what had, until then, become a haven for low-income and poor people. Fast forward now to the present time –as eager developers and corporate entities prepare for the final takeover of what many consider to be the last bastion of freedom on the west coast of California, and possibly the whole of the USA, Venice Beach. The “people’s beach” — a place where visitors and residents alike enjoy an ambiance of freedom, fun and expression. Recent attempts by Los Angeles city and Venice gentrifiers to curtail these freedoms, aided by increased police numbers, activity and enforcement, are, today, threatening the very ambiance that makes Venice “Venice”. Unsubstantiated claims of increased criminal activity in Venice, promoted by mainstream media –and those with a vested interest in gentrifying Venice –have unfairly portrayed the houseless community, young travelers, and people of color as the primary cause. These houseless, young travelers and people of color, both resident and visitor alike, are now daily targeted by LAPD officers for selective enforcement scrutiny, resulting in an overflowing congestion of the Los Angeles courts and jails. These houseless and vehicle dwellers are under constant threat of criminal prosecution as the City of Los Angeles continues its heartless persecution of the poor. Many say, however, that Venice will always now be Venice. And many of those are seen, today, to be taking new actions in that direction. 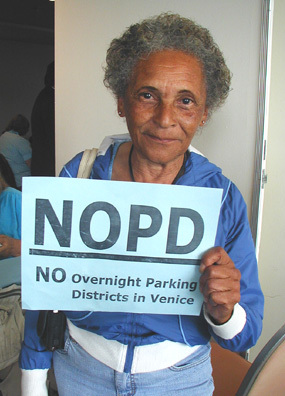 Their call –against the gentrifiers: Keep Venice Venice!